Walking Is Man’s Best Medicine, and Woman’s, Too! – Movement Unlimited Inc.
We are passionate about Pilates, posture and movement! Walking Is Man’s Best Medicine, and Woman’s, Too! Walking is one of the easiest ways to begin to move but still people will shy away from it. Last year I got introduced to nordic walking, and it changed the way I think about walking all together. Nordic walking you say? What is that? Nordic walking uses handheld poles to connect the upper body to the lower body while you step. This method of exercise has been popular in Europe for years and has finally made it’s way to Canada. Nordic walking burns up to 47% more calories over walking without poles.Now I have your attention, don’t I? Walking: The most ancient exercise, but still the best! How does this happen? This unique exercise method allows you to use 90% of your body’s muscles which increases the calories you burn and improves your body’s efficiency. The Urban Poling website reports that there are now over 115 studies on PubMed that clearly show walking with poles is an effective, safe and enjoyable physical activity. They report that physical activity, such as walking with poles, can provide improvement in all spectrums of health including physical, psychological and social well-being. 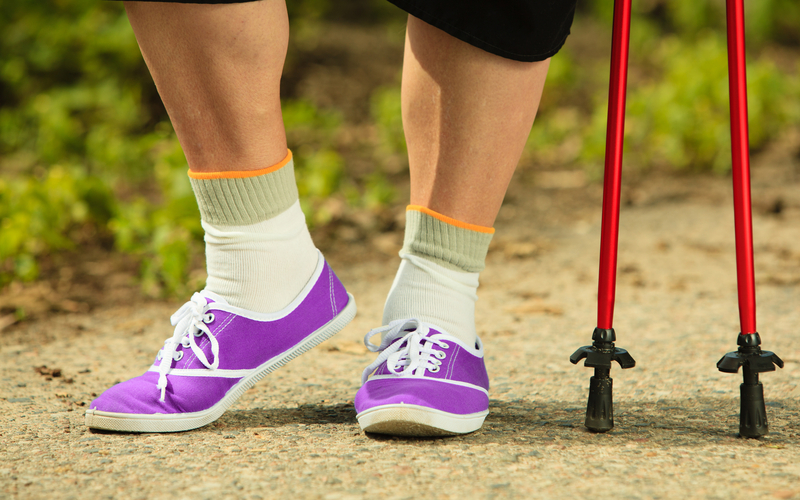 Clients with injuries, chronic conditions, post-surgery, older adults and mental health issues agree that walking with poles promotes greater independence and improves quality of life. We’ve seen our clients move more and sooner by starting with nordic walking poles post surgery. They tell us they feel safer and more confident using the poles. We’ve watched our clients change their posture and improve their body position while out for a pole walking class. Help! I Don’t Know What To Give My Kids For Breakfast!